Single Side Deadbolts - Lock on the Inside, Nothing Out. 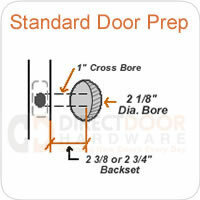 Single Sided Deadbolts have only a thumb turn on the inside of the door. The bore hole for the deadbolt is drilled only partially through the door so from the outside you don't see the deadbolt. If your door already has a bore hole completely through the door, this type of deadbolt will not work for you.